God of everlasting mercy, who in the very recurrence of the paschal feast kindle the faith of the people you have made your own, increase, we pray, the grace you have bestowed, that all may grasp and rightly understand in what font they have been washed, by whose Spirit they have been reborn, by whose Blood they have been redeemed. Through our Lord Jesus Christ, your Son, who lives and reigns with you in the unity of the Holy Spirit, one God, for ever and ever. "I shall sing forever the Lord's mercy." (Ps 89 ) This Sunday is popularly known as Mercy of God Sunday. Between 1930 and 1938 Christ appeared to Sister Faustina, a Sister of Mercy in Poland who initiated the Divine Mercy devotion. She was canonized on April 30, 2000, the Sunday after Easter, the Feast of Divine Mercy. On Good Friday, 1937, Jesus requested that Blessed Faustina make a special novena before the Feast of Mercy, from Good Friday through the following Saturday. 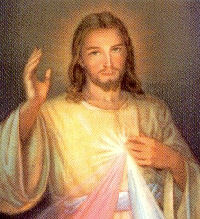 Jesus also asked that a picture be painted according to the vision of Himself as the fountain of mercy. He gave her a chaplet to be recited and said that it was appropriate to pray the chaplet at three o'clock each afternoon (the Hour of Great Mercy). The feasts of St. Peter Chanel, St. Louis Marie de Montfort and St. Gianna Molla, which are ordinarily celebrated today, is superseded by the Easter liturgy. The Holy Gospel that the Liturgy presents to us on this second Sunday of Easter, is one of the most well known, discussed, and appreciated—the meeting of the Risen Lord with St Thomas. The Fathers of the Church have given us numerous insights into this Gospel text. Likewise, it is has proven the inspiration to the numerous artists who have physically represented the events of this Gospel in order to give us a clear idea of what happened, ‘eight days after’ the first apparition of the Risen One, to the disciples congregated in the cenacle. The attention that these words evoke seams yet more paradoxical if we remember that the Lord had proposed, to the same author of the Gospel, what can be justly referred to as the Christian method, ‘come and see’ (Jn 1:39). How can we possibly reconcile these two phrases by Jesus that form the ideal setting for the whole of the fourth Gospel? Perhaps, in the end, the Lord decided to change His method? What do the words ‘have not seen’ really mean? The timely recollection of the ‘eight days after,’ which is the Sunday after the Resurrection, permits us to tie our reflection to one of the most significant Eucharistic hymns composed by another Thomas, St Thomas Aquinas. In the Adore Te Devote, which refers to the Eucharist, we read: ‘Sight, touch, taste are all deceived in their judgement of you. But hearing suffices firmly to believe’. Combining these words with today’s Gospel we can justly affirm that the experience ‘to see’ was not denied to us, but it is in contrast with the Apostle Thomas’ physical experience, who was able to put his own finger into the holes in Christ’s hands and side, whilst we can only comprehend it in the faith which is guarded and transmitted by the Church, our Mother and Teacher. That which we ‘have not seen’ is therefore the glorious Body of the Risen One. However, today we have the ability to ‘listen’ to the Word of God and the Magisterium of the Church and so we can ‘see’ the real Body of Christ which is the Eucharist. We can ‘see’ His Mystical Body which is the Church. We can ‘see’ Him in our lives and in the lives of our many brothers who, after meeting the Lord in a real but mysterious way, are united to Him in His Spirit! Like Thomas, Christ calls us to fill the holes left by the instruments of the passion in His Body with our own hands so that our lives and the verbal witness that we give proclaim His Resurrection. Our senses could betray us, but we know that we have met the Risen One and we have recognized Him! The certain hope that Peter, who betrayed the Lord three times for fear of death, proclaims to us with the words, ‘rejoice with an indescribable and glorious joy’ (1 Peter 1:8), become fully comprehensible because blessed are they that ‘have not seen’ the Risen Lord, but seeing the joy of His disciples ‘have believed’ in Him! On one occasion, I heard these words: "My daughter, tell the whole world about My inconceivable mercy. I desire that the Feast of Mercy be a refuge and shelter for all souls, and especially for poor sinners. On that day the very depths of My tender mercy are open. I pour out a whole ocean of graces upon those souls who approach the fount of My mercy. The soul that will go to Confession and receive Holy Communion shall obtain complete forgiveness of sins and punishment. On that day all the divine floodgates through which graces flow are opened. Let no soul fear to draw near to Me, even though its sins be as scarlet. My mercy is so great that no mind, be it of man or of angel, will be able to fathom it throughout all eternity. Everything that exists has come forth from the very depths of My most tender mercy. Every soul in its relation to Me will contemplate My love and mercy throughout eternity. The Feast of Mercy emerged from My very depths of tenderness. It is My desire that it be solemnly celebrated on the first Sunday after Easter. Mankind will not have peace until it turns to the Fount of My Mercy. "[Let] the greatest sinners place their trust in My mercy. They have the right before others to trust in the abyss of My mercy. My daughter, write about My mercy towards tormented souls. Souls that make an appeal to My mercy delight Me. To such souls I grant even more graces than they ask. I cannot punish even the greatest sinner if he makes an appeal to My compassion, but on the contrary, I justify him in My unfathomable and inscrutable mercy. Write: before I come as a just Judge, I first open wide the door of My mercy. He who refuses to pass through the door of My mercy must pass through the door of My justice. "From all My wounds, like from streams, mercy flows for souls, but the wound in My Heart is the fountain of unfathomable mercy. From this fountain spring all graces for souls. The flames of compassion burn Me. I desire greatly to pour them out upon souls. Speak to the whole world about My mercy." Excerpted from Diary of Sr. M. Faustina Kowalska. Read Dives in misericordia, the encyclical Letter of John Paul II on Mercy. The last stational procession is held at the Church of St. Pancras. Those newly baptized are now full fledged members of the Christian community. This church is most appropriate since St. Pancras was a young man of fourteen who sealed his baptismal promises with his blood. "Bring here thy finger, and see My hands; and bring here thy hand, and put it into My side; and be not unbelieving, but believing" (Gospel). Be a witness to the Divinity of Jesus Christ! Thus did the ancient Church speak to the newly baptized on this Sunday. Since their Baptism on Holy Saturday these converts wore white robes. Now in their everyday dress they must go out as witnesses that "Christ is the Truth" (Epistle). God the "Father "bore "witness" to this at Christ's Baptism by "water," God the "Word" became our "Blood" witness on the Cross; God the "Spirit" gave witness when by Him Jesus was conceived in the womb of Mary. Yes, this is the triple "testimony of God" which we, too, must witness unto others — that "Jesus is God" (Epistle). To the "doubting Thomases" of all future ages, Jesus gave a new proof of His Divinity in today's Gospel, "written that you may believe. . .and that believing you may hive life."